Photo by Carlos Garcia Rawlins/Reuters. Retrieved from Slate.com. I looked on with frustration the first week of February, as I combed the New York Times and my usual North American news outlets for any mention of the political crisis brewing in Venezuela. I saw none. Thankfully, (or not), that has changed, and I am including here links for anyone interested to access more information on the situation. 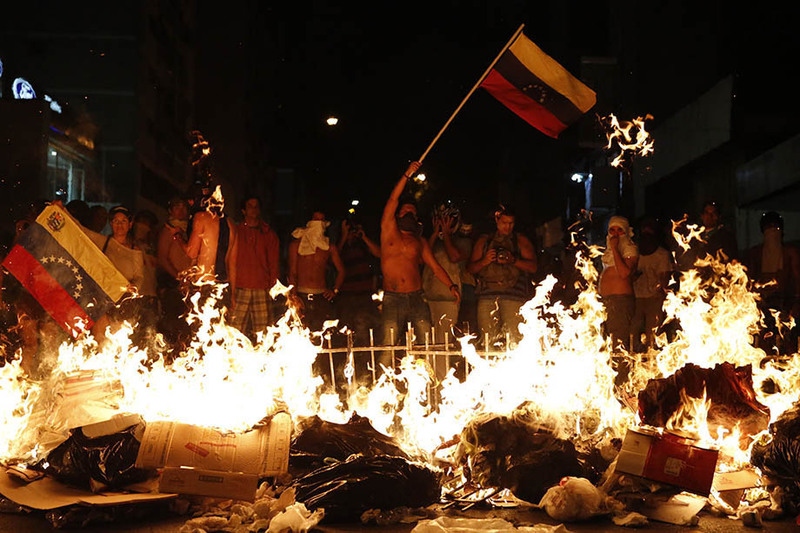 The New York Times finally stepped up its coverage, and this article describes the current social situation that has led to these recent protests, and includes a short video with some footage of skirmishes occurring in various Venezuelan cities. Now here comes an important disclaimer: if you are clicking on these links, or looking for photos or videos of the protests to see instances of shocking, unrestrained, Hollywood-like violence, you may not understand what you see at first. To put it very crassly, in our grim, violence-soaked coverage of international affairs, what’s going on in Venezuela might not look “as bad” as, say, what’s going on in Syria, or in Ukraine. While it is crude and reductive to compare the situations of these nations in this way, I think the tendency to do so points to a fundamental lack of knowledge and international discussion about what has been going on in Venezuela for the past decade. I’ve never known how to express the rage I feel at how so many American and English news sources described deceased former-President Hugo Chavez Frías as a “democratically-elected leader” (elected how many times? I didn’t realize a democracy could support 14 years of continuous rule), while failing to mention the equally-valid fact, widespread knowledge in Venezuela, that he was a leader supported by Olympically corrupt government officials, rigged elections, and dictatorship in all but name. While there is no doubt Chavez had (and still has) an all-too-real, huge, and incredibly loyal following, no one outside of Venezuela found it very important to discuss how our democratically-elected-president’s rhetoric was the main factor fanning the flame of class violence, deeply dividing the country and considerably contributing to Venezuela’s terrifying crime rate (did you know a person is murdered every 21 minutes in Venezuela? Did you know the government no longer bothers to produce crime data because of its sheer prevalence? If not, click here for some info). I am not sure that the images or videos I have seen in the international media have really captured the day-to-day uncertainty, the sense of destabilization, the sense of panic and fear felt by most citizens who are not mad with misinformed ideology, and who know there is something grievously wrong when it costs less to fill a Mazda’s gasoline tank than to buy a small bottle of water. The Spanish-speaking international media was much more on top of what has been happening, and I intend to offer some translations of the more useful articles I have found. This is particularly important, since news sources from inside Venezuela have been all but muzzled; newspapers are still functioning, but television networks have been completely silenced. For now, if you speak Spanish, please click on these links to learn more. Thank you for taking the time to explore these links. I am not optimistic of the chances the opposition has to overthrow this Hydra-headed government, but I think we should have a more important goal in mind: we must show that violation of civic rights is no longer acceptable. The Venezuelan people are no longer willing to accept this sham we call a government, and, in the face of great personal risk, they have found the courage to show it. I hope the international community will support them. This entry was posted in Current Events and tagged Crisis, Politics, Protest, Venezuela. Bookmark the permalink.